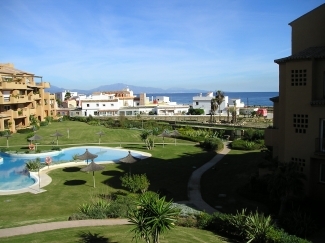 This is the premier beachfront development on the shores of the Mediterranean on the Costa del Sol. 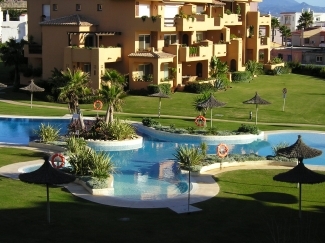 With larger than average apartments in spacious private tropical gardens, and a large lagoon swimming pool, all appointed to a very high standard, and within a secure gated development. Direct access to the 'Blue Flag' beach, with Duquesa Golf immediately behind, and only a short stroll along the beachfront to the port of Duquesa with its quality restaurants, bars, shops and the yacht harbour. 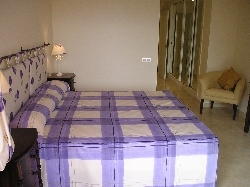 Finished and furnished to a high standard, on the first floor of four, and 'end of terrace' for privacy and quiet. The density of occupation is much lower than is typical, ensuring exclusivity. The apartment is in phase two of the development, and has a total floor/terrace area of 155 sq mtrs. The bedrooms and lounge each have their own balconies; there is lift/stair access to private car parking. 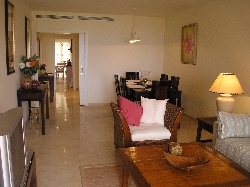 Master bedroom and living room balconies look over the swimming pool, with partial views to the sea. The second bedroom balcony looks to the beach and Mediterranean. There are recliners and deckchairs. Free internet access through community wireless router, also available locally in bars etc. The pool has a life guard, and shallow sloped end. 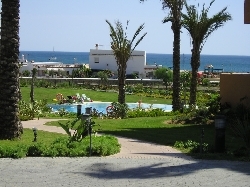 Just out side on the sandy beach are two childrens play areas, and a beach cafe. There is 24 hr security. Cot and highchair provided. All UK TV channels on 32" flatscreen TV. 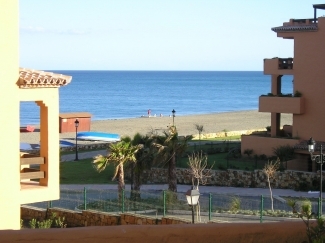 Los Granados de la Duquesa is in a privileged spot on the shores of the Mediterranean. It has everything you need to enjoy your leisure time, whether looking for activity or relaxation. Situated midway between Marbella and Gibraltar, Los Granados is flanked by European Blue Flag beaches to the fore, and golf courses and hills to the rear. Immediately adjacent is the tiny fishing villiage of Castillo de la Duquesa, with retaurants featuring the locally caught sea food. Ten minutes further stroll along the beach is Puerto de la Duquesa, a thriving yacht harbour with a rich selection of quality restaurants, bars and shops, and active night life. Dining options include Indian, Chinese, Italian, English, Irish and of course, Spanish. 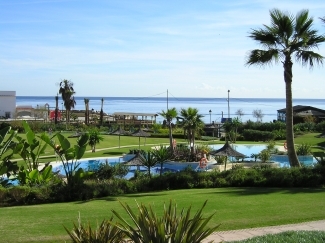 On the Mediterranean coast between Marbella and Gibraltar on the 'New Golden Mile', with beaches to the fore and golf courses and mountains behind, and easily reached via either Malaga or Gibraltar airports. A short drive further east we come to Estepona, a fishing town where the Spanish come to holiday, famed for its promenade and sandy beaches. The next highlight along the coast is Puerto Banus, the St Tropez of Spain. You can rub shoulders with the rich and famous, admire the huge private yachts, and party till dawn. 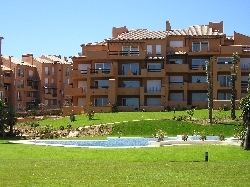 Travelling west from Duquesa, ten minutes by car is Sotegrande and the Valderrama golf course. The 1997 Ryder Cup was held here. Beyond this is the San Roque Golf and Country Club, and then to the Rock of Gibraltar. The views from the top of the rock, following a rather wobbly cable car ride, are spectacular; across to North Africa, and west to Tarifa - the gateway to the Mediterranean. Enjoy the unique history of Gibraltar, as well as English shopping. Heading inland and up into the hills you can discover the famous "white villiages". The most memorable of which is Ronda, some 50km from Duquesa. The town stadles a deep gorge on a rocky outcrop, and its Plaza de Toros is the spiritual home of bull fighting dating from 1785. More local mountain villiages are Casare and Gaucin; the former has a Moorish castle. For the more adventurous culture vulture the historic town of Jerez is 140km, and Seville a further 80km by road. Visit a different continent via a 90 minute boat trip from the port of Algeciras (near Gibraltar) to Tangier or Ceuta in Morocco. A perfect place for an African adventure and to pick up some ceramics. Selwo National Park is 15km away. Based on an African safair park, it houses 2000 animals in semi-wild conditions. Direct booking with owners, saves over 15% compared to booking through agents. Flexible changeover day. Local Agents on hand. Weekly housekeeping provided. 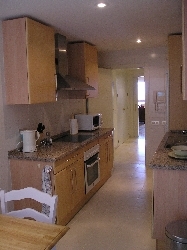 Payment in � or Euros, also Paypal or credit card (via our local agents)renter pays charges. Available for long lets and winter lets.